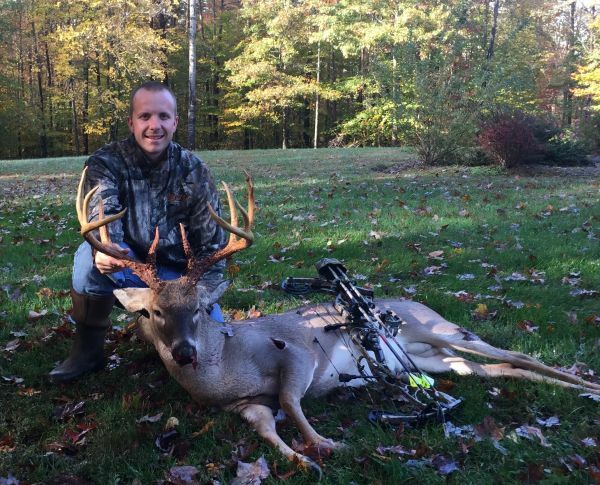 I had the privlage in harvesting this buck on 10/29/2015 at 0800 hours, in Rockingham County. I place two scent bombs out that had Trails End #307. Around 0745 hours pulled out my Primos can call and made three estrus bleats. Then at 0755 hours I started hearing in what sounded like a squirrel jumping on a tree limb. I immediately look in that direction from where the sound was coming from, and I saw leaves falling from the tree. As I was watching the leaves fall to the ground, I noticed the tree started moving. There he was at the base of the tree rubbing his antlers on the tree. I could tell that it was a big body deer, but however I only saw a little bit of his antler due to the foliage that he was in. Then he started walking where I placed one of the scent bombs, he had his nose in the air and his tongue was licking his nose. He kept taken a few steps and then he would do the same thing. Then he turned his head and looked in my direction, and my heart was going 100 mph! Fortunately, he then turned the other way, giving me the time to draw my Hoyt Faktor back. I placed my 20 yard pin in what I thought right behind his shoulder, and then I squeezed the trigger. Remind you that I was shaking so bad you could hear my teeth chattering. The arrow piled into his shoulder and he took off running. I gave him about a hour and then I went back to tracked him. I kept thinking that I had a bad shot and probably wouldn't find much blood since I hit him in the shoulder. I went to the location in where he was standing and couldn't find any blood. I kept walking to where he ran off at and still didn't see any blood. Finally, I found a speck of blood about 20 yards from where I shot him, and then after that it was blood everywhere. That Rage Hyperdermic broad head sealed the deal for sure. Then I saw him laying about 30 yards from me!!!! I was so excited.